I have a question – I’ve been “doing” yoga for several years, but have never been overly consistent. After discovering you on Youtube, I have not only enjoyed the different beginner offerings, but I feel more motivation to truly develop an ongoing “practice.” How does one develop a strong yoga practice? I’ve enjoyed your morning and evening (and the evening is better than a hot toddy for relaxation – love it! ), but I’d like to really build this into a lifestyle, more than the fits and starts I’ve done in the past. Thank you! Thank you Hannah for a great question. 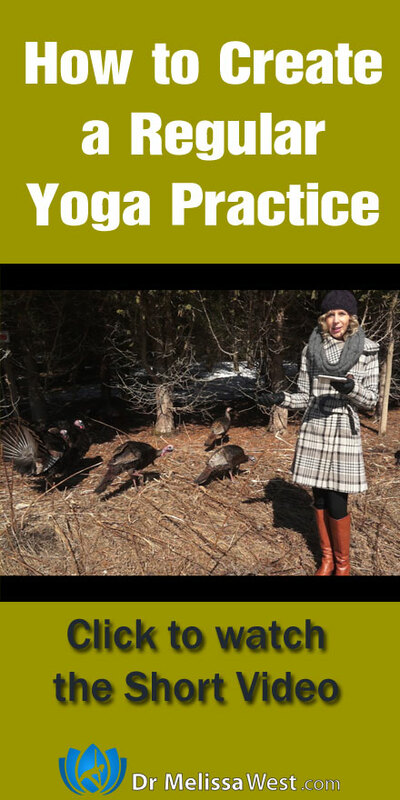 As far as developing a strong practice, I can share with you some of the things that have contributed to my success of having a strong yoga practice over the years. 1) Create a space in your home where you are going to practice. This doesn’t have to be an elaborate yoga room, in fact in my home, I practice in my living room. It simply means having all your props and yoga things in one place so that when it comes time to practice you don’t have to spend time gathering your things. 2) Practice at the same time every day. Find a time that works for you and book that time in your calendar as the most important appointment you have in your day. For me, first thing in the morning before anybody wakes up is the best time that works for my life. You may find that a different time works for you. When my daughter was young I used to practice after lunch when I put her down for her afternoon nap. Along these lines, set yourself up for success the previous day. If you have an early morning practice, like I do, make sure you go to bed early enough so that you can wake up easily in the morning to get to your mat. 3) Become part of a community that will support your practice. This might mean finding a local yoga studio or it might mean commenting on the Yoga with Melissa videos that we put out each week so that you get feedback from your teacher and hear from other students about their practice as well. If you want to take that to the next level you can join our membership community. There are several parts of our community that will support you in your daily practice. Our daily yoga connection has short videos for your week days when you go to work and get the kids off to school and longer videos for your weekends when you have more time. We meet every Monday for live classes to support each other in the development of our yoga practice. I would love to hear from you. What are your tips and tricks for staying consistent in your yoga practice? What are some of the greatest challenges you have faced in keeping your practice consistent? Leave your comments below.